Most people don’t understand what project managers do! When people ask my wife what I do, she shows them my LinkedIn® profile. After “Bring Your Children to Work Day”, my kids asked what I do besides “talk on the phone and do email.” Recently, my cousin (not a project manager) told me that he reads my blogs but doesn’t understand them. This blog is intended to explain project management to ordinary people—in other words, most of the universe. A few years ago, my wife and I remodeled our house and built an addition. I will use this experience to illustrate some of the common parts of a project. I have highlighted project terms as a guide. To begin, what is a project? The formal definition is “a temporary endeavor undertaken to create a unique product, service, or result.” What does that mean? First, something needs to be created; it can be a house, a piece of software, or even a book. Second, there is a clear beginning and end. Initiating: The idea for the project is formed. The objective and goals are identified; and the project is approved. Planning: The idea is refined. The scope (what will be delivered) is defined. An initial schedule and budget are established. Executing: The “real work” is performed during this phase—the software is coded and tested, the house is built, etc. The executing phase is the longest phase and most of the effort is expended here. Closing: By definition, projects must end. In this phase, activities needed to complete and shutdown the project are performed. The product is accepted. The team is disbanded. The bills are paid. We started the initiating phase in January 2012 when we decided that we needed a new home. First, we conducted a feasibility assessment. We evaluated our options. Build an addition? Teardown the old house and rebuild? Or buy new? To make this decision, we met with a lot of people: friends who built additions, realtors, traditional builders, design-build firms, and bankers. After a few months, we completed our research and made the decision to renovate and build an addition. At this point, we ended the initiating phase and began the planning phase. First, we developed our vendor management strategy. We decided to work with an architect and then select a builder based on a formal bidding process. This is similar to a waterfall development methodology that is common for software projects. In waterfall, specifications are documented before the work begins. To help the architect, we wrote a narrative (a scope and requirements document) that described our family needs and included pictures of other homes we liked. Some of our requirements were very specific: we wanted a house that included 4-bedrooms. Other items were less clear: we wanted a large, open kitchen. For the next several months, we met with the architect a few hours every week. These meetings were like joint application development (JAD) sessions that are used in software development. We would review the current design and make adjustments. Once we established the basic layout, we began to add details, such as placement of light fixtures and switches. Finally, we completed the analysis and design process. Our architect produced a set of blueprints and a binder of design specifications. The design specs listed the type of lumber, bracing, doors, windows, etc. to be used. We sent the plans and specs to three builders (vendors) similar to a request for proposal (RFP). We reviewed the bids and selected the builder based on price, timeline, recommendations, and how we felt about the builder. Scope and Specifications: Based on the blueprints and specifications from the architect, the builder documented what the final product (addition and renovation of old house) would include. Cost: The contract included the expected cost for the construction with allotments for fixtures, appliances, etc. that we would select later. Schedule: The builder provided a schedule that outlined all of the major tasks and tentative timelines. Change Management: A process was documented where all changes to scope and cost would be tracked on Google Docs®. We officially entered the execution phase in November with the demolition of the old porch and deck. Laying the foundation for the addition started in December. 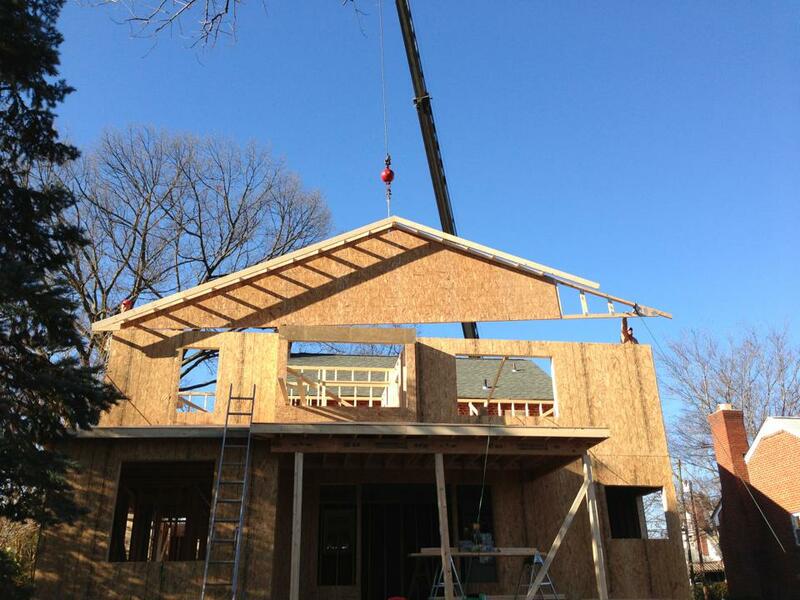 Framing was done by the end of January 2013. The work then moved inside. They started renovating the existing home, building out the addition, and blending the two. It’s amazing to watch a house being built. The framing goes so fast. Then you move inside and progress slows. This is because there are many dependencies and vendors to manage. Good general contractors are great project managers. Sub-contractors specializing in individual trades perform much of the work. The builder manages the dependencies to ensure everything is done in the right order. For example, the electrical, plumbing, and ductwork is completed before the drywall is hung, and walls are painted before the floors are finished. We learned that kitchen cabinets are on the critical path. When sequencing the project tasks, the critical path is the longest route required to complete the effort. Installing cabinets comes before: measuring and installing countertops, installing appliances, painting, and finishing floors. In our case, we selected our cabinets early, but a series of errors in the order and fabrication processes delayed our completion by a month. The final stage of a project is the closing phase. The original project was essentially done by June 2013. However, we wanted additional work, this is known as scope creep. We finished the basement, replaced the old driveway and laid a new patio. On New Years Day 2014, we had an open house to share our “new” home with our friends. We also invited our architect and builder. The last nail was hammered just a few days before the party. I hope this explained some of the basic concepts of project management. So, what do I as a project manager? I try to keep software projects on track and make my clients happy. I juggle resources from many different groups. I worry about what could go wrong and make contingency plans. In other words, I got to meetings, talk on the phone, and send a lot of emails. As a final footnote, we love our home and highly recommend both our architect and builder.